Separation of quartz sand and chromite sand into different material groups during used sand reclamation (see Sand regeneration). In comparison with quartz sand, chromite sand has a higher temperature resistance and better thermal conductivity. These attributes make this mold material especially suitable for mold areas with high material accumulation and for materials with high casting temperatures, for example in steel casting. On the one hand, chromite sand guarantees high quality for certain casting products, on the other hand, this kind of sand increases the cost of molding material, if there is no internal circulation system. Chromite sand is considerably more expensive than quartz sand. The mixture of chromite sand and quartz sand which arises inevitably at the shake-out grid usually leads to problems with the quality of the casting, as well as increased costs, when reused. For this reason, these sand varieties must be separated and put back into the mold material cycle separately. As chromite sand is slightly magnetic, modern systems separate chromite sand from quartz sand in a way that results in very pure materials, so that it can flow back into the mold and core production process as a replacement for new sand. In the system shown in Fig. 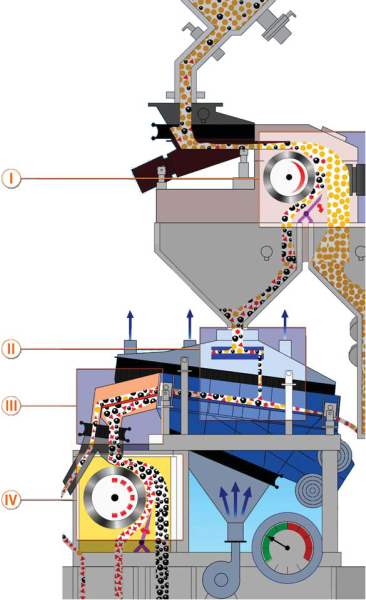 1 (GUT GmbH, Freudenberg), the flowable and dust-free sand is separated in four steps using a combined technology of two magnetic stages, a density separation and the corresponding sieving technique. In the first separation step (I) quartz sand is separated from the magnetic particles by a high power magnetic drum. The quartz sand can be reused directly in the sand cycle. The so-called magnetic fraction passes through the next three steps of the plant (II-IV), where the chromite sand is refined. During this process, undesired materials, such as exothermic risers, are largely eliminated from the sand. Chromite sand is sometimes used as facing sand, whereby quartz sand is used as filler sand but also as a mold material for core production. Consequently, in addition to quartz sand and binder residues, the accumulating used sand also contains valuable chromite sand which is to be reclaimed during used sand conditioning. The separation is carried out using a magnetic separator as the chromite sand can be weakly magnetized. Permanently magnetic, high intensity separators are used in combination with cleaning and dust-removal devices. The magnetic separator has two consecutive separation steps. In the first step, magnetic metal parts are removed, while in the second step, the chromite sand is separated from the quartz sand with a stronger magnet. If necessary, a third step with a magnet with an even stronger magnetic field can be included in order to reclaim almost 100 % pure quartz sand. Each magnetic roller has a magnetic disk, whereby the magnetic field strength is adapted to suit the material which is to be separated. The use of permanent magnets requires only a low amount of electricity compared with electromagnets. A vibrating trough allows the sand to flow over the whole width of the first conveyor belt. The conveyor belts are made of thin but highly strong material. When the sand on the belt runs over the magnetic roller, the magnetic components stay stuck to the belt. As the sand does not come into contact with the magnetic roller, it does not experience any wear. A positive air pressure between the conveyor belt and the magnetic rollers prevents dust from getting in.